Are there any steps I can take to make macOS use more of my RAM? Last weekend, I upgraded my machine to have 32 GB of RAM. I knew I didn't really need this much memory, but I figured macOS would use it for file caching or some such. 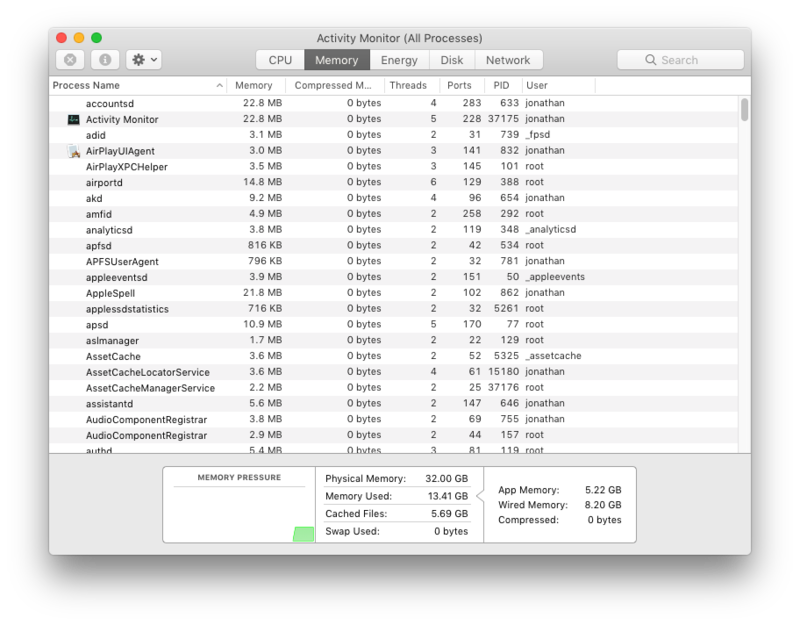 According to Activity Monitor, around 13 GB of memory are being used by applications, around 6 GB are being used for caching, and a whopping 13 GB are just being left idle. These numbers vary a bit depending on time and current workload, but in general, macOS consistently fails to use more than around 20 GB of memory. Are there any steps I can take to make macOS utilize my additional memory? For example, it would be great if I could make macOS cache files more aggressively, to offset my computer's relatively slow SSD. macOS will by default aggressively cache files, etc. in memory. In your case, it seems your programs simply aren't loading in that much data - and then there's really nothing more to cache. If you keep the system running longer and look at the values again, you'll most probably see that the numbers have changed so that less memory is left idle. You can selectively use more memory by adding a RAM disk to the system. I.e. a virtual "disk" that is really in RAM. You could then copy files to that disk to ensure that they stay in RAM. It is hugely impractical for ordinary desktop usage. Not the answer you're looking for? Browse other questions tagged macos memory . Can the mid-2010 Macbook support more than 4GB of RAM? How much more RAM can I add to my Mid 2007 24" iMac? Can the VRAM in my 2013 MacbookPro be used as RAM? Any other way to get more RAM?